. @JoaquinCastrotx is considering a Senate run from Texas. 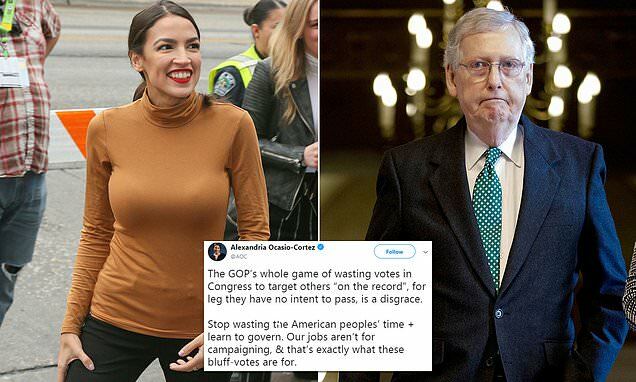 Senate Majority Leader Mitch McConnell will stage a show vote on Rep. Alexandria Ocasio-Cortez's Green New Deal Tuesday in what Democrats call a 'sham' move and they plan to vote 'present' to thwart his plans. McConnell put the vote on the calendar to force Democrats, including a slew of 2020 presidential contenders, to go on the record about the progressive plan in a vote that he knew would fail. But Democrats' plan to counter his maneuver with one of their own: they will vote 'present' - which does not count towards or against passage but does contribute to the quorum, meaning the lawmaker does not have a missing vote on their record. 'The GOP's whole game of wasting votes in Congress to target others 'on the record', for leg they have no intent to pass, is a disgrace. Stop wasting the American peoples' time + learn to govern. Our jobs aren't for campaigning, & that's exactly what these bluff-votes are for,' she wrote on Twitter on Friday. Senate Democratic Leader Chuck Schumer made the move to counter McConnell by having his Democratic senators vote 'present' on the plan.